With three months to go before this November’s midterm elections, The Tyler Loop is reaching out to candidates running selected major Texas races who aim to represent Tyler and Smith County at the local, regional, or statewide level. 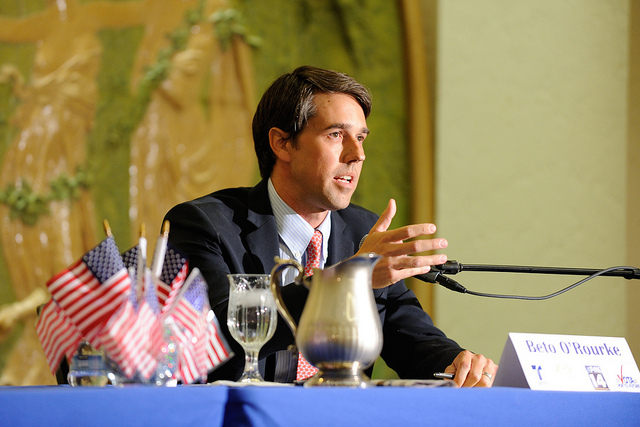 This week, we’re talking with Beto O’Rourke, the El Paso Democrat who’s captured national headlines for his attempt to unseat Republican Ted Cruz from the U.S. Senate. O’Rourke has visited Tyler three times as part of his 254-county-spanning tour of Texas, and will hold another town hall here on August 13. We’ve also reached out to his opponent, Ted Cruz, for an interview. This conversation has been lightly edited for clarity. You’re holding a town hall in Tyler soon, and you’ve been here before. Tyler is historically conservative, a small but growing city, a jobs magnet, diverse but deeply segregated—where does a place like Tyler fit in to the story of your campaign? I’ve loved being in Tyler. We’ve visited three times, and this will be the fourth. Tyler is a significant city, and East Texas is a big part of Texas. Regardless of how Republican or red it’s been in the past, it’s a place where we need to make sure everyone’s voices are heard. I think too many candidates have allowed consultants and conventional wisdom to dictate where they spend time and what they say. We’re polled and focus-grouped and consulted into almost meaningless campaigns. But when you concede nothing and write nobody off, and you contest every voter, that’s democracy. There’s nothing about the fact that a given community has consistently voted a certain way to make me think that’s the way the community will always vote. The first time I came, as we were leaving town, someone recognized me at a stoplight and rolled their windows down and said, “If you know what’s good for you, you’ll go to Stanley’s barbecue.” And we did, and it was fantastic. When we were at Don Juan’s, they had to send us out onto the street because we had exceeded the fire code. There’s always a great turnout, and I’m always surprised by the vibrancy of the community. We had a strong contingent of Dreamers come out to the earlier town halls, and they traveled to see us in other parts of East Texas. We’ve seen folks from all walks of life, coming together in a time when it’s really important to stand up and be there for our country. Tyler is 25 percent black, 25 percent Latino, 50 percent white. Like most Democrats, you’re going to need turnout in all of those groups. What’s your message to local organizers who are trying to get diverse Tylerites—people who don’t always think they have much in common, and who don’t always trust each other—to find common cause in your campaign? I would ask them to look at the things we’re talking about in this campaign. About universal healthcare and equity in healthcare. Getting behind our heroic public school teachers, making sure they have a livable wage and can retire in a way that’s livable. About our criminal justice system, which has produced the largest prison population on the planet, and is disproportionately black and Latino despite the fact that there are similar rates of drug use across all races. The fact that our state has a school-to-prison pipeline, and is one of the worst in the world for maternal and infant mortality, and even worse for black families. We’re not just talking about being a more just society. We’re also recognizing that when everyone can live to their full potential, all of us will share in the benefits of that. All of us will do better. That’s not just my message. That’s what I’m hearing from people across the state of all backgrounds, all races, and all walks of life. They embrace that message and reflect it back to me. We’re a state that’s [nearly last] in voter turnout not by accident but by design, and we see that in all communities including Tyler. A lot of people who are not represented in the elected leadership in Texas—the most racially and ethnically gerrymandered state in the county—are making rational decisions and coming to the conclusion that their vote doesn’t count. The onus is on me to transcend that. By traveling to Tyler, that’s what I’m able to do. Not take anyone for granted and not write a single person off: that’s what I want to be a part of. I’ve been following one of your field organizers, Emily Pinal, who’s been registering young minority students to vote in our region. What does someone like Emily, the daughter of immigrants, 21 years old, Latina, a student—mean to your campaign? There are people who have not been represented in Texas political life despite the fact that they make up significant and growing numbers of the electorate. We have 36 congressional districts in Texas, but there has never been a Latina to represent Texas in the U.S. congress, though Texas is [over 40 percent] Latino. Someone like Emily is the future of Texas, and who I want leading us in that future. Veronica Escobar, who will replace me, is another example of who I want leading us going forward. Too many of us have been pushed to the margins, and ensuring that everyone has the chance to lead is not only the right thing to do—it’s perhaps the only way we can win. At a recent NAACP banquet in Smith County, a local black leader expressed some skepticism that your campaign would do much for blacks in Tyler in return for their support. That’s a bigger story about the Democratic party right now, with dependable black voters saying, what do we get for showing up? So, what will your black supporters get for showing up? I hope they get the same thing everyone’s going to get: very active representation and the opportunity to fully participate, not just in the campaign but in how we serve and govern, and how we represent Texas going forward. We’re going to do that by listening. I co-sponsored legislation to give states resources to stop focusing on cash bail, and allow people to get back to their jobs, families, and educations. Given that we have disproportionate arrest rates and disparities in income across races doesn’t mean someone should have to sit behind bars when others who have resources are free to go. That was one conversation that turned into a specific policy proposal. We also have to ensure that police departments that disproportionately use force against black people and people of color in their communities, have accountability in their communities. Federal support should be contingent on local police departments reporting on how they use force and who they use force against. I don’t expect anyone to just come through the doors. I don’t want anyone to feel they’re taken for granted. I hope they’ll look at where it is that I’m going across our state during this campaign, who’s part of this campaign, and legislation I’ve written or co-sponsored. I expect to be held accountable by people in Tyler and across this state. Next articleWill a summer of global climate extremes turn more East Texans into believers?